Sunsilk Perfect Straight Shampoo 180ml, for lively, Straight hair that moves with you! • Sunsilk Perfect Straight locks in the shape of your wet hair through the day to keep it Straight & aligned*. • Its straight lock technology along with Silk Protein helps keeps hair aligned even after hair dries. • For hair that is vibrant, silky and full of movement**. Sunsilk Perfect Straight Shampoo is now New Outside & Incredible Inside. Its most joyful purple shampoo pack comes with an easy to handle grip and a wow inside as before. 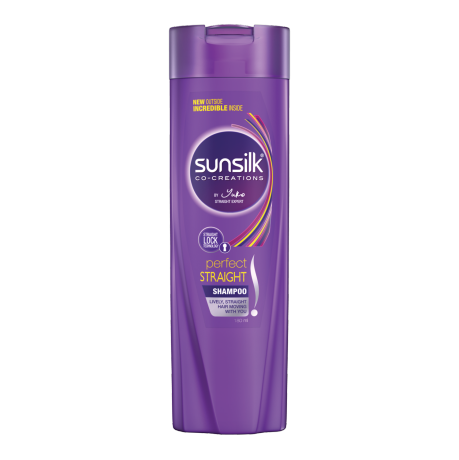 Sunsilk Perfect Straight comes with specially developed straight lock technology along with silk protein. The new formula complemented by a fresh perky fragrance works from the first wash, to keep your hair straighter*. Does your wet straight hair lose its straightness, after it dries? Thanks to Sunsilk Perfect Straight your straight hair stays set even after it dries*! Now your hair stays set, all day* & remains silky, full of movement**. 1. Rinse your hair with water. 2. Apply a coin sized amount of shampoo. Lather. Wash using a rotating finger motion to nourish and cleanse pores. 3. Rinse with running water till all shampoo is washed off. Best results when followed up with use of Sunsilk Perfect Straight conditioner. The conditioner comes with revolutionary conditioner technology for oh so manageable hair. Water, Sodium laureth sulfate, Dimethiconol and trideceth-10( and) TEA-dodecylbenzenesulfonate, Cocamidopropyl betaine,Sodium chloride, Perfume, Carbomer, Amodimehicone and cetrimonium chloride and trideceth-12, Guar hydroxypropyltrimonium chloride, Disodium EDTA, DMDM Hydantoin, MICA and Titanium Dioxide, Mineral oil, Methylchloroisothiazolinone and Methylisothiazolinone, Hydrolyzed silk extract, Ssodium hydroxide, Citric acid, CI 17200. NOT SURE WHAT YOU’RE LOOKING FOR? HERE’S A BIT MORE INFO.